I’m getting ready for the Disc-It Cook Off in July. The 3rd Annual Disc-It Round-Up is July 16th at Isleta Casino. The cook-off is also a charity event and all proceeds will benefit the Children’s Miracle Network. The goal this year is to raise $50K, I will be posting details and more information on how you can contribute to a great cause. Although the contest is still three months away, it’s never too early to start perfecting a recipe. I’m not saying this is going to be my contest recipe, but it could be. If you want to know what the final dish will be, you will just have to show up on July 16th, stop by my booth, say hello, try my dish and pick up a copy of the recipe. Sound like fun? For Sunday Dinner, I assembled the heart of the AlbuKirky Taste Testers to try out a recipe for shrimp and grits. Cheryl and I have been planning this recipe for a long time and decided it was time to quit talking and start cooking. Cheryl was in charge of the grits and I cooked up the shrimp on the Disc-It. This recipe is still a work-in-progress, but I thought it would be interesting to share with all of you the development of this dish. 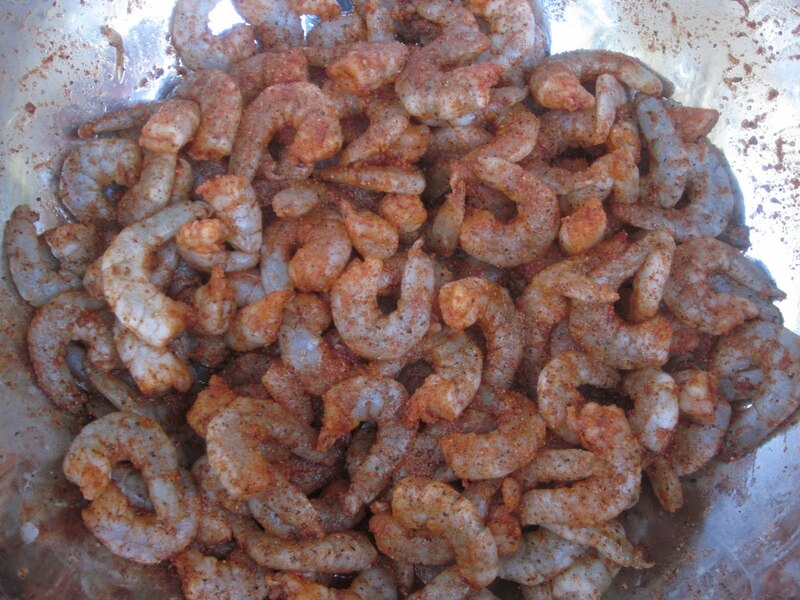 I started with a big bag of 20-30 size shrimp, shelled and de-veined, and marinated in a nice white wine. I drained most of the wine leaving just enough for the sauce and then seasoned with my AlbuKirky BBQ Rub. I seasoned the shrimp until each was equally seasoned, I’m really bad about measuring but I estimate it was about 4 tablespoon. I fired up the Disc-It and started cooking the chorizo. I fried the chorizo in the disc and when it was done I pushed it to the top of the disc leaving behind the spicy drippings. 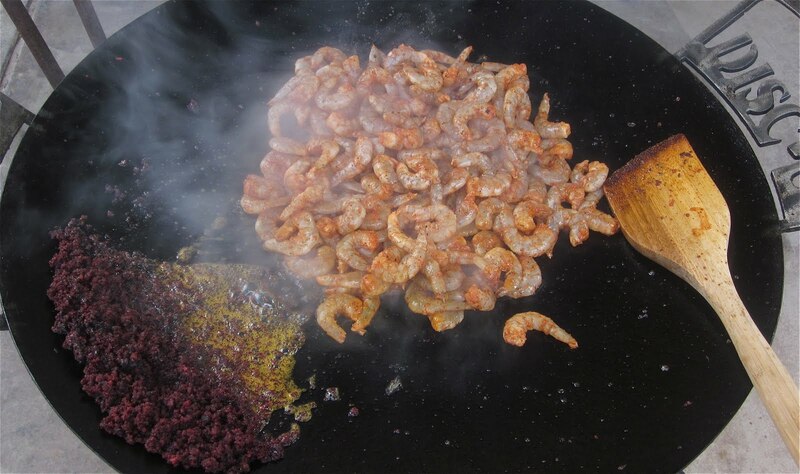 I added my seasoned shrimp to the hot drippings. The chorizo drippings, the white wine and seasoning combined together to make a rich and spicy sauce. So far the dish was coming together as I expected, but the moment of truth was fast approaching. My lovely wife Cheryl was in charge of the other ½ of the dish, the grits. Cheryl was born in Kentucky and takes her grits very seriously. She made a creamy grits with green chile. 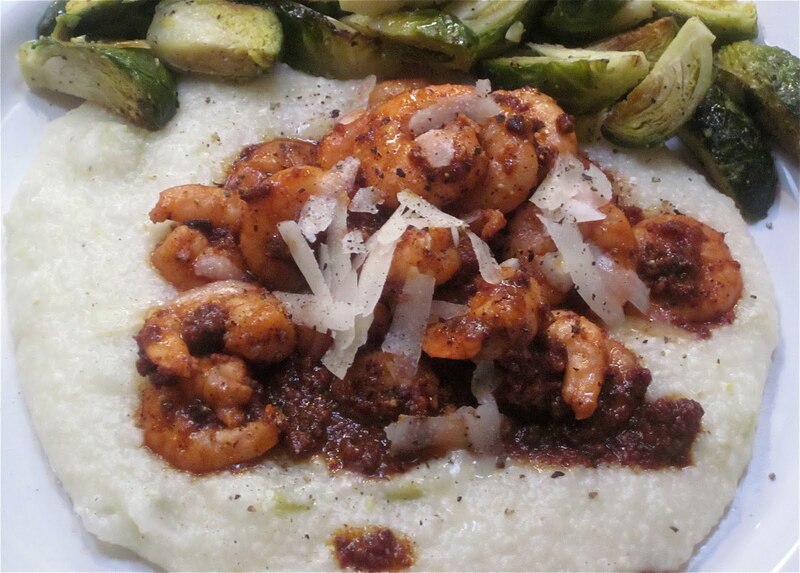 To make the grits creamy she added buttermilk and incorporated some roasted green chiles. Now the moment of truth…the tasting. The first bite was good, I could taste the shrimp, the BBQ rub, and the chorizo, and the grits added a nice creamy contrast. Overall the dish was really good and we ate every last bite of shrimp, however, there is plenty of opportunity to improve my culinary creation. As usual I was a little heavy-handed with the spice and I used bit too much chorizo. 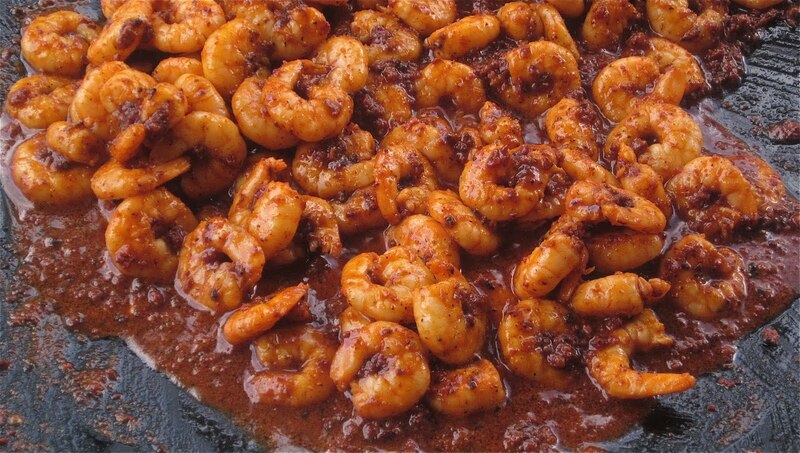 Next batch, I’m going to cut back on the seasoning and chorizo so that the shrimp will be the prominent flavor in the dish. I would also like to get the fruity-ness of the wine to come through, as well. The dish was good, but it’s not good enough to win a cooking contest. So it’s back to the drawing board. Anyone want to be part of the next taste team? What kind of chorizo did you use. I mean I know it was Mexican style or raw, not cured Spanish style. But I have found certain brands cook and taste much differently than others. The Cacique brand (something like that) had a much more loose texture than Johnsonville.